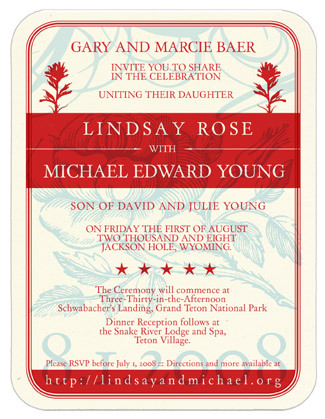 letterpress wedding invitation Lindsay and Michael needed a distinctive piece of correspondence for their wedding in Jackson Hole, WY. Both nature lovers, they wanted the design to reflect the flora of the area; the Indian Paintbrush, which would be in gorgeous red bloom at the time of the event, was chosen as a recursive design element. An anecdote from the design process here relates to the reply card (middle thumbnail below): the copy originally read 'RECLINES WITH REGRET'. No one caught the mistake until the very final proofing stages, right before we went to plate!